100% pure Java Mail server designed to be a complete and portable enterprise mail engine solution. Supports currently available IETF protocols, including SMTP, LMTP, POP3, IMAP4, ManageSIEVE. We also plan to support JMAP. Apache James Server is able to store user and message data either in any JPA-compatible database, in Cassandra (allowing fast, reliable, even real-time replicated storage) and on a file-system (Maildir). Provides a powerful, flexible mail application engine through support for the Apache Mailet API. With its Mailet pipeline architecture, Apache James Server can be used not only to provide standard e-mail services, but also to implement custom e-mail applications. via the well-known Spring framework - read more. or via the Guice module - read more. Manage domains, users,... via a command line client, a REST interface or a well-known JMX tools - read more.See also metrics in live with Grafana. Apache James Server serves as a mail application platform. 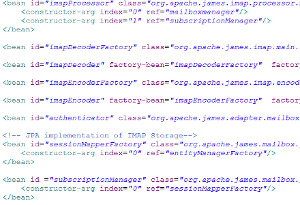 The Apache James Project hosts the Apache Mailet API, and provides the Mailet container. These features makes it easy to design, write, and deploy custom applications for mail processing. 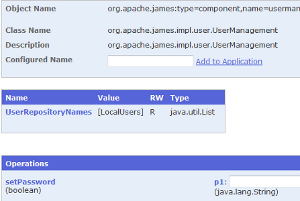 Apache James Server 3.0 is now built on top of Spring 3.0 or Guice in replacement of the Avalon Application Framework. With Spring, We keep the good development practices introduced by Avalon such as Component Oriented Programming and Inversion of Control. 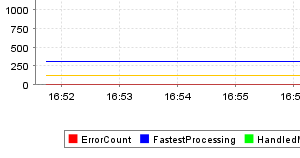 The stable and robust Spring container provides a strong foundation for the Apache James Server. Apache James Server is a secured mail server by default - read more.